The largest genera of crane species is Grus - and also the name of a constellation. 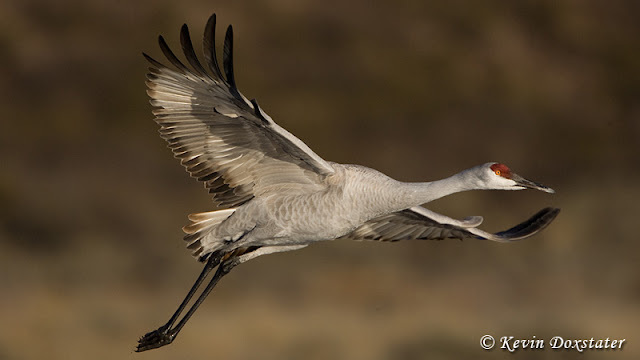 Sandhill Crane (Grus canandensis) at Bosque del Apache NWR. So what birds do we have up there? The six recent additions begin (alphabetically) with Apus. 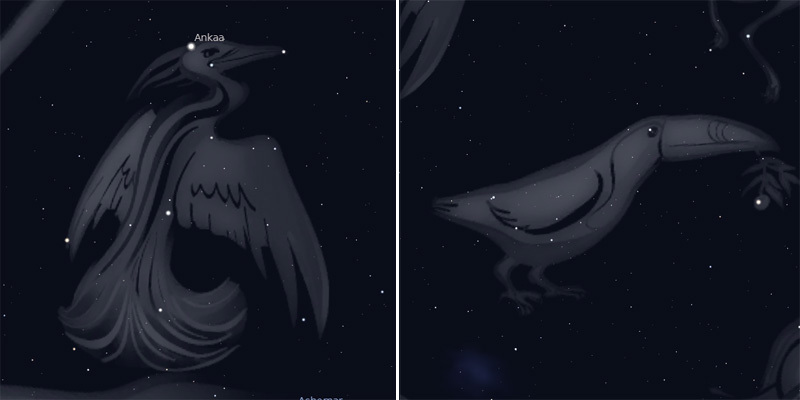 This constellation represents a bird-of-paradise. Next up is Columba, a dove, which was originally named Columba Noachi after the dove in the story of Noah’s Ark. Grus is a crane and Pavo a peacock. 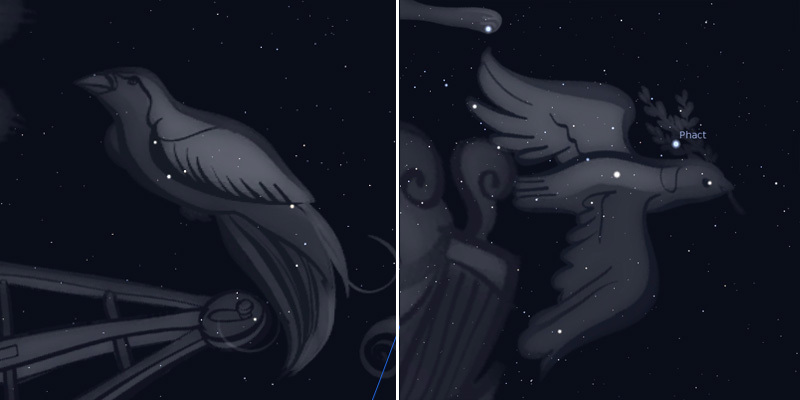 Pictured above are artist renderings of 4 of the "modern" avian constellations: Apus, Columba, Grus, and Pavo (clockwise from top left). Phoenix and Tucana are the final two 16th century additions; Phoenix is the mythical bird that rose from its ashes and Tucana is, of course, a toucan. While the first six are birds and it is nice to see them represented, the “original three” are a lot more fun because there are stories to tell from the ancient mythologies they represent. Phoenix (left) and Tucana (right). Aquila is Latin for eagle and in Roman mythology Aquila performed tasks for Jupiter. There are several different stories in Greek mythology, the classical tale is that the eagle delivered thunderbolts for Zeus. Babylonian astronomers/astrologers also had a constellation representing an eagle and the Greeks probably used this same constellation in their stories. Visible in late spring and summer, Aquila is a large constellation near Cygnus the swan. Its brightest star, Altair, is part of an asterism known as the Summer Triangle (an asterism is a grouping of stars that are not a constellation – Deneb in Cygnus and Vega in Lyra are the other stars that make up the Summer Triangle). 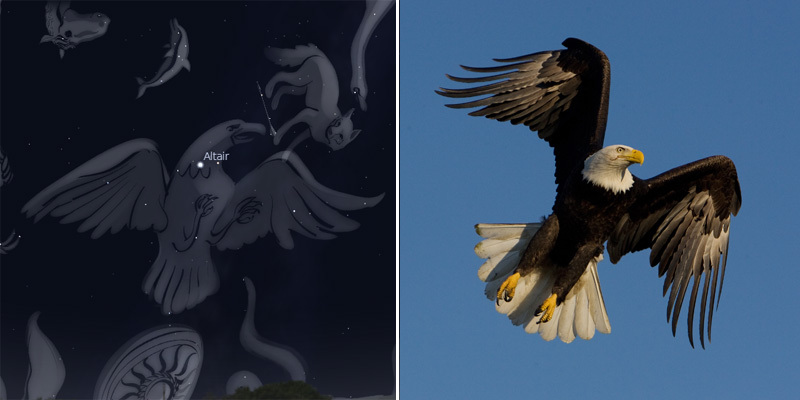 Aquila art - and a Bald Eagle in a very similar pose up in Homer, Alaska. A raven in Babylonian mythology, Corvus is either a raven or crow to the Greeks. In one Greek story, Apollo sends raven to get him some water, but waited for some figs to ripen before returning. The raven returned late with the water, along with a water snake in the chalice. Apollo was angry at the raven’s tardiness and put him, the snake (the constellation Hydra), and the chalice (Crater) in the sky – the raven is able to see the water filled chalice, but is separated from it by the snake and remains eternally thirsty. Corvus is a small constellation visible in the spring just below Virgo. 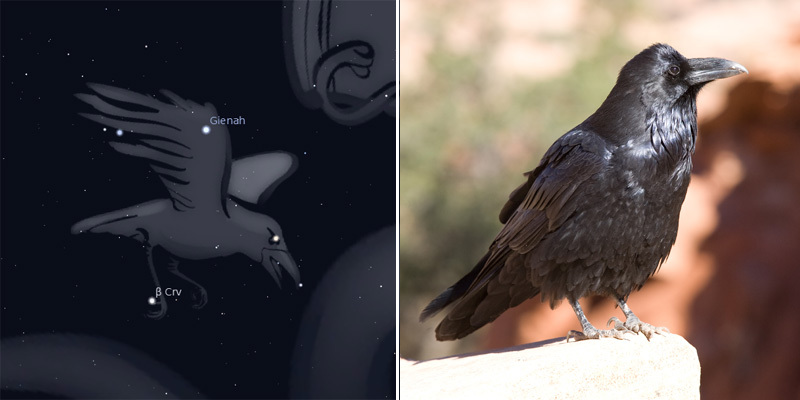 Corvus constellation art and the largest Corvid, a Common Raven. 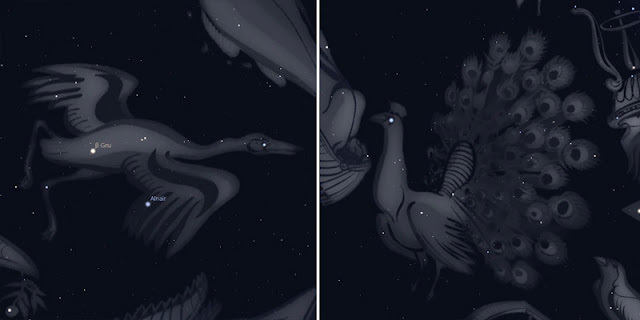 And finally we come to Cygnus the swan, a large, prominent summer constellation. There are actually several different Greek legends involving the swan, including one where Zeus turns himself into a swan to seduce Leda, who would later give birth to the twins (Gemini). In another, Orpheus, the son of Apollo, was transformed into a swan and placed in the sky by Zeus after he was murdered. This particular story also includes Lyra, Orpheus' beloved lyre, which was thrown into a river following his murder, and Aquila the eagle, who was sent to fetch the lyre from the river so Zeus could put it into the sky, too. 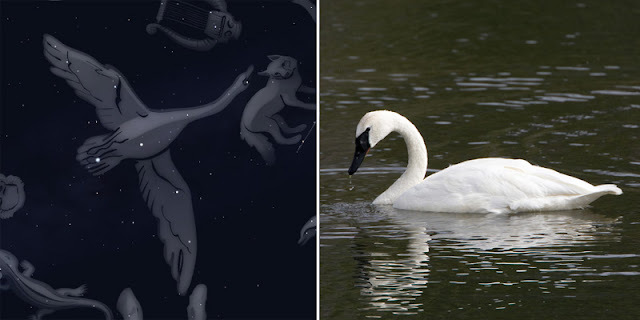 Cygnus constellation art and a Trumpeter Swan in Alaska. Cygnus is the genus for all of the world's swans. Of course these are just a few of several possibilities, and I’ve based this on the commonly accepted constellations. However, different cultures had their own stories to tell about the night sky. The Chinese have a constellation called the Vermilion Bird of the South. The Northern Cross, an asterism in Cygnus, represents a bird’s foot to some Native American tribes. Is the California Condor the legendary Thunderbird to some Native Americans? It has a constellation in their stories, too. And an Inuit story describes the Milky Way as “tracks made by raven’s snowshoes as he walked across the sky.” Learning about birds in culture is just another reason why I find that “birding is fun” . . .
Constellation art in this post is from the planetarium software Stellarium. Fascinating post Kevin. Our modern indoor society living in super-lit cities seems to have become detached from the wonders of the night sky that have been so important to mankind throughout history. Glad to see there are still some star-gazers out there. Pretty and interesting. I'll be looking at the stars a little differently from now on. Thanks all for your kind comments! It was a fun piece to put together and, even though I knew some of the star stories already, I learned a couple more while I was at it (poor thirsty raven . . . ). Fascinating post! Outstanding images! I learned something new today. Thank you for sharing!